Indonesian fried rice is a delicious concept that involves an assortment of mystery meats and vegetables studding a flavourful rice dish. It’s the second-biggest multisport event in the world after the Olympics. Currently, 11 300 athletes from 45 countries across Asia are competing in Jakarta and Palembang in Indonesia at the 18th annual Asian Games, a major sporting event that takes place every four years. The international spotlight on Indonesia is a prime opportunity to take a culinary voyage to the country to which we owe the wonders of sambal oelek and nasi goreng, to name a few. Here are a few of the foods that best distill the flavors of Indonesian cuisine. Over the past few years, households around the world have pushed aside the bottle of Sriracha sauce in their fridge, to make room for another formidable chili paste: Indonesian Sambal oelek. Hot sauce aficionados need no introduction to the condiment that has found permanent places of honor on many a refrigerator shelf. Unlike Sriracha sauce which is both sweet and spicy, sambal oelek is a simple paste made with fresh red chillis, vinegar and salt. The result is a cleaner, more versatile flavour profile that can be dangerously moreish. Indonesia’s tourism office calls satay — meat skewers marinated in a sweet soy sauce and barbecued over an open flame — the country’s most famous dish. But its origins can actually be traced back to India, when Muslim traders introduced the kebab concept to Indonesia, where the flavours were given the South East Asian treatment. Though chicken is the most common and most popular satay, other variations include lamb, beef, pork, scallops and ox tongue. Skewers are also accompanied by a savoury dipping sauce, with spices and styles that vary according to different regions. Along with satay, bakso or meatball soup is a popular street food across Indonesia. It also got a shout out from former president Barack Obama during a visit in 2010, when he waxed nostalgic about his childhood days slurping up the savoury soup from street vendors. Bakso can refer to the soup itself or the meatballs which can be made with chicken, beef, pork or shrimp. A bowl of Bakso consists of broth, meatballs, rice noodles and tofu and is usually garnished with fried shallots, celery, and the aforementioned sambal chilli paste. 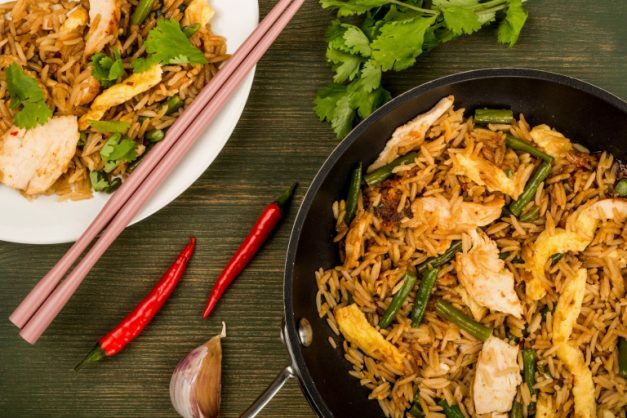 Indonesian fried rice, often described as Indonesia’s national dish, was originally devised as a way to salvage leftovers and avoid food waste — an everything-but-the-kitchen-sink-type idea. The result is a delicious concept that involves an assortment of mystery meats — chicken, sausage, fish — and vegetables studding a flavourful rice dish made with kecap manis, Indonesia’s version of barbecue sauce, thicker and sweeter than soy sauce. This spicy, perfumed meat dish is often given place of honour at Indonesian tables during special occasions like Eid al-Fitr, weddings and other ceremonies for its fragrant richness and depth of flavor. The dish originates from Minangkabau, a tribe in West Sumatra. Rendang can be made with either beef or lamb and is made with chilli, coconut milk, galangal, lemongrass, garlic and shallots.